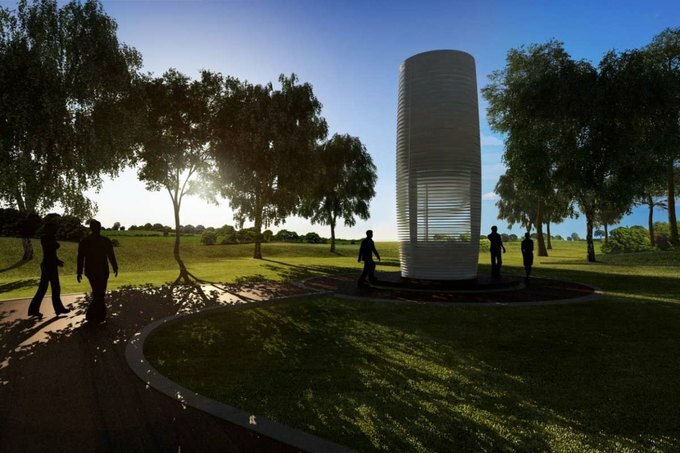 The Smog Free Tower, designed by Dutch artist Daan Roosegaarde, is a 23-foot-structure designed to clean up polluted air. the collected smog will be compressed into small pieces of jewelry. Roosegaarde launched a Kickstarter on July 22 to raise $54,000 towards creating a prototype of the tower. The tower uses technology based on air purification systems in hospitals. It produces 3,500 cubes of smog per day and each cube cleans 35,000 cubic feet of air per day. That's 123 million cubic feet of cleaner air every day. The jewelry produced from compressed smog particles goes for $54 to $271 on the Kickstarter. Although the pieces are not made with renewable energy just yet, Roosegaarde is hopeful that solar power will be used in the future. Air pollution in California kills 25,000 people per year and costs $200 million in medical bills. Smog-related deaths are growing fastest in Asia, where 65% of all deaths are due to air pollution complications. Some common air pollutants include carbon dioxide, methane, and sulfur dioxide.